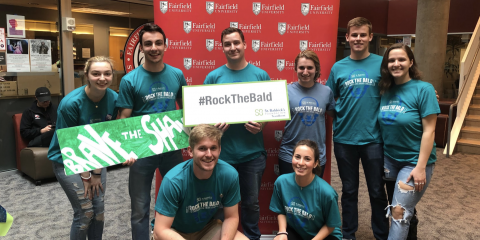 As the Fairfield University Women’s Volleyball squad readies for the Metro Atlantic Athletic Conference tournament, they endured a Sunday afternoon contest against Canisius College at Alumni Hall and fell with a score of 3-1 to the Canisius Golden Griffins. This was their regular season finale while the Metro Atlantic Athletic Conference tournament commences Thursday, Nov. 15. The first set between Canisius and Fairfield went back-and-forth with Fairfield dropping the first set 25-17. Junior Mayda Garcia opened up the scoring with her first kill of the day off of an assist from Alexis Rich ‘22. After that, the Stags and Golden Griffs split the first 16 points before Canisius started to pull away. As the score reached 12-8 in the first set, Canisius sprung ahead with four straight points as server Cassidy Cerrani provided the attack for the Golden Griffins. As Canisius collected four consecutive points, Fairfield recorded four straight tallies of their own, bringing their set deficit within four, courtesy of outside hitter Garcia. Then the momentum swung in Canisius’ favor as they topped the Stags, taking a 1-0 lead in the contest. Much like the first set, these two MAAC foes exchanged blows, tying 5-5 after 10 points. 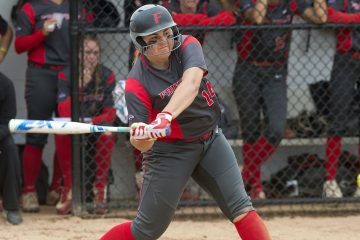 After three errors by Fairfield, the Golden Griffins took a 10-7 lead, but Fairfield would strike back. With a few errors from Canisius and a kill from Stag Sonja Radulovic ‘20, the score was once again tied at 11. These Stags were not going down easy. After another four point deficit in the second set, middle Fairfield blocker Sydney Williams ‘19 was at the forefront, serving an ace and leading her team back to an even score of 18-18. The Stags fought until the very end, unfortunately dropping the second set by a score of 25-23 through the efforts of Canisius’ Gabrielle Darnaby. Down 2-0, the Stags wanted to do everything to avoid a loss on Senior Day, so for the third set, they came out with a purpose. This third set was another hard fought battle, with Fairfield forcing a fourth set 26-24. The Stags took a quick 11-6 lead charge against the Golden Griffs, courtesy of two serve aces and a kill from Radulovic, a kill from Garcia and errors from Leah Simmons and Melina Woods of Canisius. The Golden Griffins answered back with points of their own from Woods and Carley Shifflet. 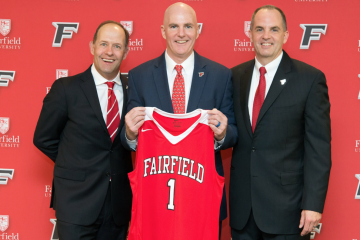 Later on, Fairfield gained a 17-12 lead, but Canisius was not letting the Stags go easy. After kills by Darnaby and Simmons as well as an ace by Shifflet, the Fairfield lead shrunk to two, the score being 17-15. Back-and-forth these two teams went, exchanging scores until both teams were even at 24, now needing to win by two points. Middle blocker Luci Albertson ‘21 provided a clutch kill, assisted by Rich, who leads the Stags in assists. Fairfield claimed the third set after Canisius’ Simmons committed an attack error, leaving the score at 2-1 in favor of the Golden Griffins. 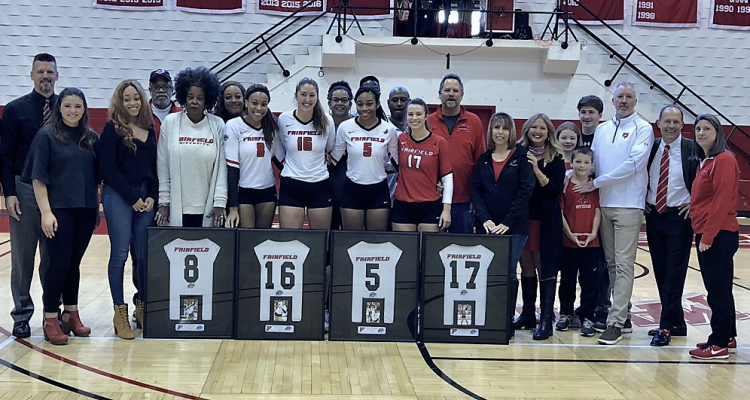 Entering the fourth set, Fairfield had the chance to even the score at 2-2, but Canisius wanted to close out the Stags and put a damper on Senior Day. Just like the previous three sets, this set did not disappoint and the Stags gave every single ounce of effort, but ultimately fell 25-23 to Canisius. After jumping ahead 12-9 with an Albertson kill, Fairfield looked in control, but the Golden Griffs went on an 8-1 run to take a 18-13 lead late in the fourth set. This five point deficit swelled to eight points, but the Stags never quit, even to the last point of the last set. Fairfield put together a 7-0 run of their own to make it a 24-23 game. Finally, Simmons ended all Fairfield hopes by recording her 15th and final kill of the day, securing a 3-1 win over the Stags. 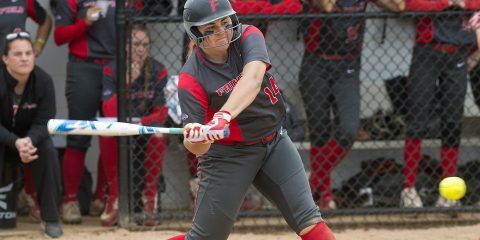 Fairfield finishes their regular season with a 12-15 record, being 11-7 in MAAC play. They head to Lake Buena Vista, Fla. for the MAAC Championship tournament to face Manhattan College on Thursday, Nov. 15.